Simon Sinek’s famous TED presentation, “How Great Leaders Inspire Action,” includes a great lesson on innovation. He discusses the race for flight between the well-funded, highly educated, and widely acclaimed Samuel P. Langley and the unfunded, unknown Wright Brothers. Langley was after fame and wealth while the Wright Brothers were pursuing a dream with all their heart, overcoming obstacles and “innovation fatigue factors” that Langley would never face. Their persistence and passion made the difference. Yinglan Tan’s new book, Chinnovation: How Chinese Innovators Are Changing the World, offers many lessons for the West. Tan explores several dozen case studies of entrepreneurs from small and large companies with roots in China. Some of the lessons counter popular Western perceptions about business in China and others point to broadly applicable lessons in entrepreneurship. The book is well written with key takeaway points highlighted throughout. A common theme is that Chinese innovators are finding success in spite of highly limited initial resources by taking risks intelligently but aggressively, pushing for cash flow early in the process, and growing rapidly with the help of a healthy network and quick learning. Opportunities are being found in numerous spaces, both low and high tech and with novel or basic business models. Contrary to some stereotypes, integrity matters a great deal in the rising Chinese economy, with respect for others playing an important role in how business is done. Chinese companies are also gaining a competitive edge by being able to retain and attract top talent. It’s not just through good salaries, but also through many factors that build trust and loyalty. For example, Wayne Dai, CEO of Verisilicon Holdings, explains that they pay attention to the corporate cafeteria to make sure there is outstanding food. “The first thing I look at in a Shanghai company is the quality of the cafeteria. Without a good lunch, there is no productivity. Two vendors compete in our cafeteria.” They also offer stock options to many in the company. The receptionist, for example, has stock options.. Such steps build loyalty and increase productivity of employees. The rise of entrepreneurship in China is now being followed with the rise of strong IP rights. There is much progress to be made, but companies are learning that IP matters and that failure to respect the IP of others can result in painful surprises. China is now on the path to surpassing the United States in terms of patent applications. It is a myth that China’s competitiveness just comes from being a source of low cost labor. They are leading the world in R&D in many high tech fields and are becoming the intellectual powerhouse of the planet, not just the source of labor. Between low cost resources, high tech IP, and a Wild West spirit of entrepreneurial adventure, the innovation potential of China cannot be overestimated. The West has many lessons to learn if it is to remain competitive in the global economy. The landscape of higher education will soon witness dramatic change as technology coupled with new business models provides customized education to more people at lower cost. For unprepared institutions, the winds of change may be disruptive. Important aspects of the future of higher education are illuminated in The Innovative University: Changing the DNA of Higher Education from the Inside Out (John Wiley & Sons, 2011), a landmark book by Clayton Christensen of the Harvard School of Business and Henry J. Eyring, Vice President of Academics at Brigham Young University-Idaho. Clayton is the man who gave the world a new lens to better recognize the threats and opportunities of “disruptive innovation,” and Henry Eyring at BYU-Idaho is a thought leader who has chronicled the details of a successful experiment in disruptive innovation in education at BYU-Idaho. The collaboration of Christensen and Eyring represents a pleasantly surprising combination of talent and insights, one that is fitting given the influence of Harvard on BYU-Idaho’s journey of innovation. Henry J. Eyring kindly allowed me to interview him about this forthcoming book that is scheduled for release later this summer. He displayed great passion for the mission of taking the blessings of education to more people at lower cost, and applying new tools and business models that can make this possible without sacrificing quality. Henry is concerned that the cost of a 4-year college degree has increased by 2 to 3 times since the 80s while starting salaries for graduate have remained flat in real terms, leaving universities vulnerable to classic disruptive innovation in which a once easy-to-ignore “inferior,” low-cost alternative improves gradually to the point where it can become a serious threat. Online course content, once viewed as inadequate, is now generally accepted by students and can result in better educational performance, especially when used in hybrid models with face-to-face elements and with adaptive tools that respond to what and how students learn. Online models can allow a course to be customized to meet the learning styles and needs of a student, improving the quality of education. “Existing universities must view online learning as a sustaining innovation for their models,” Eyring says. Failure to embrace the potential of online learning will leave universities vulnerable to disruption, both from competitors and from budgetary pressures. “Even the best universities will be pressed to show better ROI.” They may need to become less universal, no longer offering the same graduate programs in all fields as they do in science and engineering. 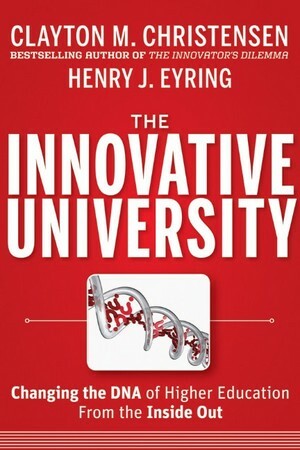 There is a need to change the very DNA of the university, the thrust of The Innovative University, a remarkable fruit of the collaboration between Henry Eyring, who began writing about the BYU-Idaho experience in 2008, and Clayton Christensen, who teamed up with Henry to add the framework of disruptive innovation and further insights from the Harvard perspective to complete this scholarly but highly readable work. Like many of the best books about the future, this one is based upon a great deal of history. Much of the book explores the stages of development in education and business models for two very different schools, Harvard and Brigham Young University-Idaho (initially Bannock Stake Academy, then Ricks College and more recently BYU-Idaho). The scholarship is outstanding, the writing crisp and clear, and the stories told interesting and instructive. Some readers may not wish to grasp the historical foundations of these universities and the currents of change that have brought us to our present state. Fortunately, the book is organized to allow the impatient to turn to the latter portions of the book (say, Parts Four and Five) to access major conclusions and recommendations. elevating faculty pay to above-average levels to compensate for the additional effort required of the faculty to make the more intense BYU-Idaho system succeed. The importance of online content as an element of disruptive innovation is emphasized in the book, which offers numerous valuable insights into the business models and applications of the technology that have brought success to BYU-Idaho, as well as the foundations for Harvard’s success and leadership in education. Those interested in either school or in higher education in general should appreciate the historical development and insights. Many other innovative schools are also highlighted in case studies throughout the book. The authors use the theme of DNA throughout the book, and argue that successful educational reform requires changing the DNA of a university. “Genetic reengineering” is needed to build new models and systems that will be sustained over time and grow. The book is aimed at identifying and spreading the new genes that will result in healthier, stronger education. For those that resist and cling to the old DNA, disruptive innovation could one day overtake the universities and leave them unable to compete and unable to serve, saddled with shrinking resources, higher costs, and fewer students willing to endure their increasingly less competitive programs. The learnings from the journeys of BYU-Idaho and Harvard University are extended to the broader challenges faced by institutions of higher education worldwide. How can they adapt their programs to be more efficient, to better serve more students at lower cost? How can they provide education without requiring students to take on a mountain of debt? How can education be more personalized, more customized, to help students better prepare for the careers or graduate educational experiences they desire? How can universities better achieve the missions of teaching and research? What tasks do universities really need to focus on for the future? The authors offer valuable guidance, based on extensive research and insights. Though higher education has remained relatively immune from the pressures of disruptive innovation for years, the power of new business models and technologies coupled with social and financial pressures will lead to change that may surprise and even pummel many universities now on the traditional path of making education more expensive and elite. Christen and Eyring offer a monumental guide to avoiding the pain of disruption and capitalizing on the promise of positive disruptive innovation for those institutions with the courage and vision to become an innovative university. For educators, policy makers, parents and students, I recommend The Innovative University for breakthrough thinking that can help transform education. Further information below about BYU-Idaho is based on input from Steve Davis, their Alumni Director, derived from some online comments. Since the decision in 2000 by President Gordon B. Hinckley to turn Ricks College into BYU-Idaho, the university has grown from a capped enrollment of 8,200 students on a traditional fall/winter track, to over 14,000 students each term and over 22,000 annually — largely because of the innovative 3-track (year round) enrollment. BYU-Idaho has also launched several online initiatives, including the Pathway pilot program, discussed several times in The Innovative University, that enables students to earn BYU-Idaho professional certificates, associate, or bachelor degrees while staying at home. The online offerings at BYU-Idaho are different than independent study in that each course is semester and cohort based. Students are part of cohorts, groups of students they will interact with to enhance the educational process. or example, students in an online section could have classmates from other Pathway sites, as well as regularly enrolled BYU-Idaho students. Online content is coupled with face-to-face interaction at a local physical location to help students in multiple regions away from BYU-Idaho. Students meet weekly and take an Institute class for BYU-Idaho credit, but the remainder of their curriculum is online. This program is now operating at 23 domestic sites (all LDS Institutes) as well as Accra, Ghana, and Puebla, Mexico. Allergan (NYSE: AGN), the major multi-specialty pharmaceutical company with expertise in ophthalmology and beauty, has been on a tear in the stock market, driven by its bold approach to innovation. The market cap, now $25 billion, has roughly doubled in the past year. I heard CEO David Pyott speak to Jim Cramer on Mad Money last night and am impressed with the financial commitment to innovation. I am also impressed with the new product development work that is done in extending great products to new fields. For example, Botox® (Botulinum Toxin Type A), used so successfully for cosmetic surgery, also has potential to modify hyperactive bladders or juvenile cerebral palsy. Their expertise in neuroscience is also being applied to migraine headaches, where a promising product is in Stage 3 clinical trials. The Botox® approach to skin beauty is being enhanced with Juvederm® hyaluronic acid (HA) dermal filler formulation, a material that can be injected into the skin to fill some wrinkles. They are also addressing the challenge of obesity with their FDA-approved laproscopic band, a less invasive approach to bariatric treatment. In ophthalmology, one of their most profitable segments, a host of products treat eye conditions such as glaucoma or dry eye. Allergan’s products are well suited for the needs of the aging baby boomer population and appear to be riding a wave of technical success well matched to a demographic wave. Many growth opportunities still exist, and with the heavy investment in innovation and research, Allergan appears poised to continue growing, something that is unusual for many large pharmaceutical companies these days. The company began in 1950 when chemist Chemist Stanley Bly developed anti-allergy nose drops and got the help of his friend, Gavin S. Herbert Sr., who owned a pharmacy. Two years later, after listening to advice from a pharmacist about patient needs, they developed an eye drop with anti-histamine, the first such eye drop in the United State. Sales skyrocketed and Allergan became a major player in ophthalmology, which today makes up almost half of their business still. Listening to market feedback and acting on clues and suggestions from knowledgeable people like a pharmacist allowed Allergan to quickly shift its focus and its product array in the early days to address an important unmet need. This led to eye products, not just nose drops, and the opportunity in ophthalmology that will continue to be huge for Allergan, now representing nearly 50% of sales, if they can keep an eye on innovation. On Wednesday, June 22, 2011, hundreds of entrepreneurs will join together in a one day event to celebrate innovation and job creation in the “New North” of Wisconsin. Northeast Wisconsin Entrepreneur Networking Day—or NEW END—takes place at Fox Valley Technical College, Appleton, WI. The event is dedicated to the specific needs of entrepreneurs and small business owners by packing networking, education, and collaboration into one day. (This information is cross-posted at SharpIP.com (Sharp Innovation).